Seven years ago Bruce sat next to me on a flight out of Nashville. We both changed planes in Detroit and there I frantically wrote down as much of our conversation as I could remember. His heavy southern drawl forced me to listen to him carefully so I could mentally translate what he was saying as he spoke. I remembered him, but my notes from that day sat unread — until this week when I pulled that notebook off the shelf while shelving last year’s journals. I leafed through and stopped on the page where I had written the heading “Bruce – Flight from Nashville to Detroit”. His story, even his voice, flooded back. We had done the perfunctory small talk while waiting for take off. He told me he worked in aircraft manufacturing. I told him that I was a mother eight. I stared out the window at the other airplanes on the runway. I liked the imagery and smiled at it. Our plane took off. It’s my favorite moment of every flight — wheels leaving pavement. “Lemme show you somethin’,” he said, pulling his wallet out of his pocket. He flipped through the pictures and stopped at a well-worn picture of a smiling little boy. “That’s my boy,” he said proudly. “I’m so sorry,” I murmured, but it felt inadequate. “I’m so sorry,” I said again. I didn’t ask for details and I couldn’t help thinking that 17 years before, she had been a little girl who lost her brother. Life is hard and sad — and we rarely know the other person’s story. Bruce chatted with people across the aisle and in front of us. He was traveling with several people from his work. “That’s pretty amazing,” I said. I used to help with haying here in New York, but it was purely for the fun of helping the neighboring dairy farmer. 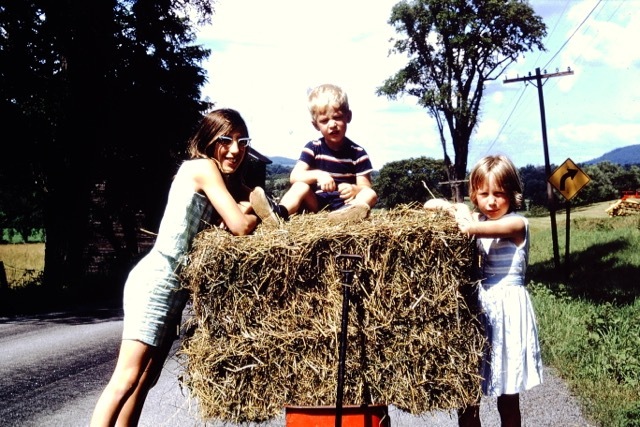 I loved riding in the hay wagon, but someone was always driving the tractor. I tried to picture haying with no driver. Taking a few hay bales home. I’m the tough cookie on the right. “You know what the Mason-Dixon line is?” he asked. I was worried that he was testing my knowledge as a northerner. “Didn’t it divide the slave states from the free states?” I asked. He laughed like he had just told a good joke. I laughed because I hadn’t expected a linguistics lesson from this burly southerner. “I’m not much of a tea drinker,” I confessed. Frankly, I didn’t know that either. In Detroit, I wrote it all down — about his son and his daughter and his cancer and his poverty and sweet tea. I tried to write the phrases exactly as I had heard him say them. Our flight had been less than two hours but he had shared so much with me. I once heard Christian singer Jason Gray tell a story about a mentor that he had. Jason respected his mentor and wanted to be like him. Jason asked him, “How did you become you?” His answer: pain. The hardships in our life shape us but they don’t define us. Bruce had known deep sorrow and in our brief encounter had shared some of the difficult times he had known, but he also knew how to embrace life. I’m thankful I got to sit next to him for that flight and listen to his story. You wonder, after the passage of time, if he’s still around. Hardship should teach us and should strengthen us and should make us better people but it only can if we let it. Bruce clearly has done just that. I’m guessing what we call ‘Builders Tea’ in Britain which is effectively extremely strong tea with sugar heaped in it would not pass muster as swait tay in the south (and I’m very afraid to say, I wouldn’t drink either). A wasp amongst eagles is the most wonderful image. He sounds like the kind of man, that it’s a blessing when he touches your life, even if it’s just a light touch.